Secretary-General Ban Ki-moon (left) at a working dinner with Foreign Minister of the Russian Federation Sergey Lavrov (right). Secretary-General Ban Ki-moon stressed the need to find a political solution to the ongoing conflict in Syria as well as to renew momentum for the holding of an international conference to achieve that goal, as he discussed the crisis with Russian Foreign Minister Sergey Lavrov. The two men discussed the escalating humanitarian crisis and the disconcerting rise in sectarian violence in Syria over a working dinner in New York last night, according to a read-out provided by Mr. Ban’s spokesperson. In June, discussions about the international conference were held in Geneva with participation from senior United States, Russian and UN officials, led by the Joint Special Representative of the UN and the League of Arab States, Lakhdar Brahimi. Still not scheduled, the goal of such a conference would to be to achieve a political solution to the conflict in Syria through a comprehensive agreement between the Government and the opposition for the full implementation of the Geneva communiqué of 30 June 2012. Issued after a meeting of the Action Group for Syria, the document lays out key steps in a process to end the violence. Among others, it calls for the establishment of a transitional governing body, with full executive powers and made up by members of the present Government and the opposition and other groups, as part of agreed principles and guidelines for a Syrian-led political transition. Since fighting began in March 2011 between the Syrian Government and opposition groups seeking to oust President Bashar Al-Assad, more than 100,000 people have been killed, almost 2 million have fled to neighbouring countries and a further 4 million have been internally displaced. In addition, at least 6.8 million Syrian require urgent humanitarian assistance. Mr. Ban and Mr. Lavrov also discussed the Middle East peace process, with the UN chief saying he was encouraged by the resumption of direct negotiations between the Israelis and the Palestinians, and reiterating that the UN would do its utmost to support them. The Secretary-General and the Foreign Minister also discussed the situations in Lebanon and Afghanistan, among other topics. 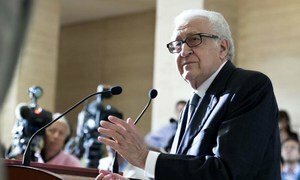 An international conference to find a political solution to the Syria crisis is not likely to be held in July, the Joint Special Representative of the United Nations and the Arab League for Syria, Lakhdar Brahimi, said today.